Below you will find descriptions of our current classes. Classes are grouped into age appropriate programs—which include Tippy Toe (Ages 2-5); Happy Feet/Fancy Feet (Ages 6-10); Juniors (5th-7th grade); and Seniors (8th grade and older). You can view the class schedule by program here. If you have questions about any of our classes or programs, or need class placement assistance for your child, please feel free to contact us. A Creative Movement class for 2-year-olds that incorporates basic Ballet. The focus is on developing gross motor and classroom skills, while having fun! The class also incorporates basic tumbling. Pre-school Ballet designed for 3-year-olds; Halfway through the year the class becomes half Tap/half Ballet. The focus is on developing gross motor and classroom skills, while having fun! The class also incorporates basic tumbling. 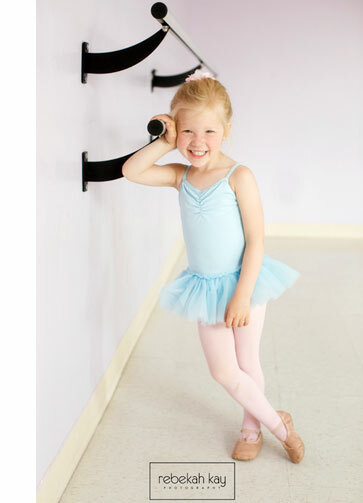 Pre-school Tap and Ballet class for 4-year-olds. The focus is on developing gross motor and classroom skills, while having fun! The class also incorporates basic tumbling. Tap and Ballet curriculum designed for 5-year-olds; Jazz is introduced halfway through the year. The focus is on developing gross motor and classroom skills, while having fun! The class also incorporates basic tumbling. Ballet is the foundation of all forms of dance, therefore it is strongly encouraged that all students participate. Ballet helps dancers to gain strength, flexibility, coordination, and balance, which are necessary in all forms of dance. This technique is also great at enhancing students' athletic abilities in various sports. Tap is a rhythmic form of dance that allows students to create specific sounds through intricate movements of their feet. Jazz is a contemporary form of dance that is usually performed to highly energetic music. There are many different styles that can be incorporated into this technique. Hip Hop is a street style form of dance that is performed to energetic music. Contemporary dance is a blend of Jazz, Ballet, and Modern techniques. It allows for vast amounts of creativity and artistry from dancers and choreographers, as it can be portrayed in many different ways.